It's not the fruit but the leaves that are purple on purple plum trees, sometimes called cherry plums. Deciduous in the winter, the trees bear ornamental flowers in spring followed quickly by the emergence of reddish leaves that mature to a deep red-purple to deep purple. These trees make vibrant contrasting accents in landscapes that are filled primarily with green-leaved trees. Depending on species, purple plum trees are best grown in U.S. Department of Agriculture hardiness zones 2 through 8. The Myrobalan plum (Prunus cerasifera) is the source for the many modern hybrid purple plum tree varieties. 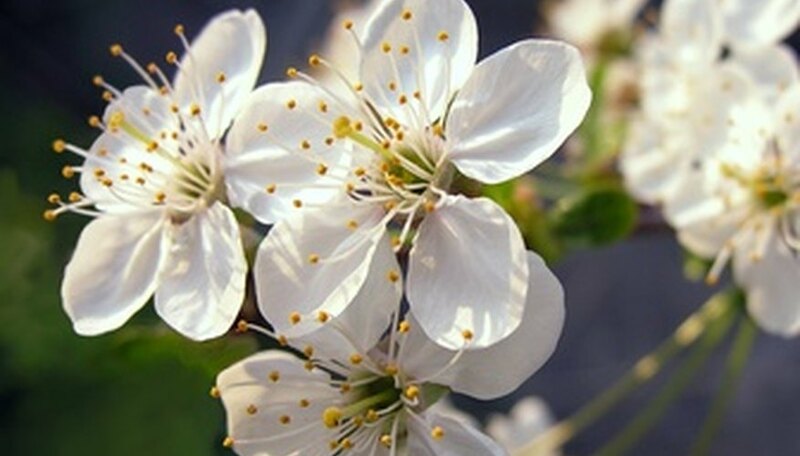 Native to western Asia and the Caucasus, this tree bears white springtime flowers and dark green leaves. Originally other fruits, like edible sweet and sour cherry or plum, were grafted onto the tough, hardy rootstock of the Myrobalan plum. A historic genetic mutation prior to 1880 discovered by the gardener to the Shah of Iran revealed the first purple-leaf variety named 'Atropurpurea' according to American wood plant expert Dr. Michael Dirr. It is often called the Pissard plum to honor the gardener who selected it. After the introduction of 'Atropurpurea' into the horticultural world in the 19th century, other cherry species were genetically crossed with it to yield other purple plum trees. When 'Atropurpurea' was hybridized with Japanese apricot (Prunus mume) the species Prunus x blireiana was formed. It is a tree to 20 feet tall with fragrant pink flowers and reddish-purple leaves that mature to green. When 'Atropurpurea' was crossed with sandcherry (Prunus pumila), a small tree about 10 feet tall resulted, called the purpleleaf sandcherry (Prunus x cistena). Its pink flowers open alongside the young purple leaves in spring. Depending on mature size, purple plum trees are grown as singular specimen trees that double as a small shade tree in lawns, foundation beds or mixed borders. Shorter types work well as an informal screen or hedgerow. Michael Dirr suggests using these purple-foliaged plants with discretion as their visual color can be overpowering if not balanced with lots of green-leaved plants nearby. Numerous insect pests and fungal diseases afflict purple plum trees, causing irregular branch dieback. Some are relatively short-lived, depending on their genetic lineage and pace of growth. As a general rule, smaller trees that grow quickly endure significantly shorter life spans than the slower-paced larger trees.